SOURCE: AP/MATT ROURKE Scientists need professional research technicians the way doctors need professional nurses, but grant-based research programs rarely provide for these key positions. April showers bring May grant deadlines. At least that’s how every scientist now vying for a piece of the $21.5 billion in new government funding for scientific research thinks about springtime this year. This is the amount of money authorized for research as part of the economic stimulus plan passed by Congress and signed by President Obama earlier this year. On campuses across the country one can hear a near-audible sigh of relief among academic faculty who hope the new funding boost will provide stability for ongoing research projects or the chance to pursue new ones. The National Science Foundation alone has received an extra $3 billion this year and is putting nearly $2 billion towards funding backlogged research proposals, with the other $1 billion divided among instrumentation, infrastructure, and educational programs. Funding for the first round of proposals accepted by the NSF will expire in a staggered fashion starting in 2012. Although the 2010 budget has not been finalized, the Obama administration has asked for expanded science funding for several agencies including the National Science Foundation, the Department of Energy, the Department of Health and Human Services, and the Environmental Protection Agency—a signal that the administration will continue to support more federal research funding. This is all to the good, of course, yet with social expectations high that these new funds will ensure our nation’s long-term scientific preeminence, now it is a good time to think about how to make the business of research sustainable in the long term, too. A good place to start may be an often-unacknowledged workforce that together contributes untold hours to U.S. research output. Who are these Samaritans of science? They are U.S research technicians. This workforce provides long-term research continuity, stability, and expertise at our nation’s scientific institutes and universities. They train incoming students, manage and update extremely expensive and delicate equipment, and ensure that laboratories meet demanding health and safety regulations. Yet despite their importance, no formal training, career path, or job security exists for this crucial science-and-technology workforce. 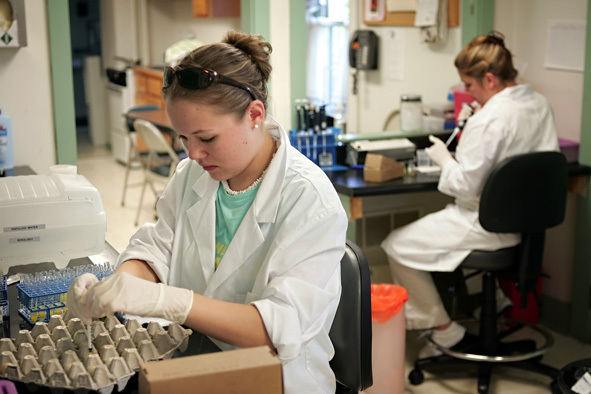 Because of our nation’s grant-based culture of scientific funding, graduate assistants are preferred over professional research technicians because they are cheap and do not require health and retirement benefits. And even when research technicians are funded to manage and run new equipment and new technologies that underpin most basic research, they are frequently the first to be let go when soft money dries up. Problem is, cutting-edge research requires increasingly state-of-the-art technologies that are exceedingly costly, requiring professional care and maintenance. Equipment such as scanning electron microscopes, which allow for the visualization of surface structures at the micro-scale, or automated crystallization robots (which perform reproducible solution set-up for protein crystallography), or Raman spectrometers (which are used across many fields to measure molecular vibrations) can be extremely pricey, often costing the equivalent of an entire budget for a principal investigator (the lead researcher) for a single instrument. Unfortunately, because of our grant-based funding culture, high-tech instrumentation is often purchased with no thought toward the need for long-term professional personnel to operate and maintain this equipment. As a result, sophisticated equipment is abandoned and both principal investigators and other university researchers suffer the loss of technical know-how and support. Most importantly, this vicious cycle it is a colossal waste of money for our federal government. Sponsoring the creation of university degree programs for technical training in the laboratory sciences. What’s more, there’s an existing model for doing so that is common at many universities across the country—nursing programs. Nurse Practitioners, for example, have different degree certifications than Registered Nurses and Licensed Practical Nurses, and job responsibilities and salaries that reflect these differences. Nurses provide technical support to the medical field by performing routine procedures, managing patient records, and helping to educate medical staff and the public. Experienced nurses with advanced degrees are involved in hospital and clinical administration, which often involves dealing with insurance companies and supervising the training of new nurses. In much the same way, a professional structure for U.S. research technicians would facilitate the sustained work of scientists by providing a workforce with the specific job of overseeing day-to-day research tasks, managing equipment, and training new students. Additionally, like nursing programs that benefit associated medical schools, degree programs for technical research training would also provide a readily accessible and qualified workforce for affiliated universities. Technical certifications and degree programs could be tailored for a wide variety of fields, including molecular biology, chemistry, polymer science, engineering, or agricultural technology. Similarly, career benefits, job titles, and pay scale could be determined to appropriately reflect training levels. The American Recovery and Reinvestment Act takes an initial step in this direction. The new law authorizes the National Science Foundation to fund Professional Science Master’s degrees at 128 universities across the country. The PSM degree program targets students to work at the interface of science and business, industry, government, or communication. These degree programs are absolutely crucial for sustaining the profession of science and helping to translate research for broader social goals. Yet, they must also address our national needs to create a knowledgeable and well-trained workforce that can provide both interdisciplinary and disciplinary research support in multiple fields. Perhaps the next step would be to use the PSM initiation to promote more technically focused masters programs. These masters programs could be tacked onto departments with existing doctoral degree programs. Senior faculty could translate their wisdom to the next generation by spearheading efforts to develop curricula with a focus on techniques, instrumentation, and research. Support of these initiatives by senior academics would help change the perception that a masters program is a “consolation prize” in route to (or in lieu of) a doctorate degree. Additionally, new technical masters-level programs will attract students that have a passion and interest in research but may be dubious about pursuing a stressful career as an academic faculty member. Major funding agencies such as the NSF, the Department of Energy, the National Institutes of Health, NASA and the National Oceanic and Atmospheric Administration could do their part by requiring proposals, particularly those involving new instrumentation, to include provisions for technical support. Instead of three-to-five year, project-oriented grants, these agencies could develop a special division designed to specifically support grants for technical personnel, and could apply these “special funds” for eight-to-nine year contracts to support technical staff for specific instrumentation or department goals. The United States still leads the world in intellectual productivity and scientific achievements, but our position is by no means assured. Sustaining a viable workforce to support our “brain industry” is crucial for 21st century innovation. Investing government funds in a technical research workforce will increase productivity, limit wasteful government spending, and provide alternatives to the standard academic career path for college students interested in advanced science and technology degrees. The skills, time, and focus of this workforce to see research implemented and carried out in a thoughtful manner would additionally bring practical know-how to many of the new funding initiatives that tend toward high-risk, high-reward, and interdisciplinary research. Perhaps most importantly, a trained technical workforce would support primary research that will benefit universities, national laboratories, and the private sector. With the new infusion of cash from the federal government, U.S. research funding agencies have a real opportunity to influence the course of scientific research for decades to come. Instead of supporting the same grant-based system of research funding, it is time for the science community to think carefully and critically about the best ways to build research infrastructure to address crucial long-term innovation needs for national development. Estella Raulfs is an NSF-IGERT graduate fellow and a Ph.D. candidate in Biochemistry at Virginia Tech. What’s more, there’s an existing model for doing so that is common at many universities across the country—nursing programs. Nurse Practitioners, for example, have different degree certifications than Registered Nurses and Licensed Practical Nurses, and job responsibilities and salaries that reflect these differences. Nurses provide technical support to the medical field by performing routine procedures, managing patient records, and helping to educate medical staff and the public. Experienced nurses with advanced degrees are involved in hospital and clinical administration, which often involves dealing with insurance companies and supervising the training of new nurses. In much the same way, a professional structure for U.S. research technicians would facilitate the sustained work of scientists by providing a workforce with the specific job of overseeing day-to-day research tasks, managing equipment, and training new students. Additionally, like nursing programs that benefit associated medical schools, degree programs for technical research training would also provide a readily accessible and qualified workforce for affiliated universities. Technical certifications and degree programs could be tailored for a wide variety of fields, including molecular biology, chemistry, polymer science, engineering, or agricultural technology. Similarly, career benefits, job titles, and pay scale could be determined to appropriately reflect training levels. The American Recovery and Reinvestment Act takes an initial step in this direction. The new law authorizes the National Science Foundation to fund Professional Science Master’s degrees at 128 universities across the country. The PSM degree program targets students to work at the interface of science and business, industry, government, or communication. These degree programs are absolutely crucial for sustaining the profession of science and helping to translate research for broader social goals. Yet, they must also address our national needs to create a knowledgeable and well-trained workforce that can provide both interdisciplinary and disciplinary research support in multiple fields. Perhaps the next step would be to use the PSM initiation to promote more technically focused masters programs. These masters programs could be tacked onto departments with existing doctoral degree programs. Senior faculty could translate their wisdom to the next generation by spearheading efforts to develop curricula with a focus on techniques, instrumentation, and research. Support of these initiatives by senior academics would help change the perception that a masters program is a “consolation prize” in route to (or in lieu of) a doctorate degree. Additionally, new technical masters-level programs will attract students that have a passion and interest in research but may be dubious about pursuing a stressful career as an academic faculty member. Major funding agencies such as the NSF, the Department of Energy, the National Institutes of Health, NASA and the National Oceanic and Atmospheric Administration could do their part by requiring proposals, particularly those involving new instrumentation, to include provisions for technical support. Instead of three-to-five year, project-oriented grants, these agencies could develop a special division designed to specifically support grants for technical personnel, and could apply these “special funds” for eight-to-nine year contracts to support technical staff for specific instrumentation or department goals. The United States still leads the world in intellectual productivity and scientific achievements, but our position is by no means assured. Sustaining a viable workforce to support our “brain industry” is crucial for 21st century innovation. Investing government funds in a technical research workforce will increase productivity, limit wasteful government spending, and provide alternatives to the standard academic career path for college students interested in advanced science and technology degrees. The skills, time, and focus of this workforce to see research implemented and carried out in a thoughtful manner would additionally bring practical know-how to many of the new funding initiatives that tend toward high-risk, high-reward, and interdisciplinary research. Perhaps most importantly, a trained technical workforce would support primary research that will benefit universities, national laboratories, and the private sector. With the new infusion of cash from the federal government, U.S. research funding agencies have a real opportunity to influence the course of scientific research for decades to come. Instead of supporting the same grant-based system of research funding, it is time for the science community to think carefully and critically about the best ways to build research infrastructure to address crucial long-term innovation needs for national development. Estella Raulfs is an NSF-IGERT graduate fellow and a Ph.D. candidate in Biochemistry at Virginia Tech.